Atlas Energy merger arb/spin off opportunity? The merger agreement seems to be airtight since neither changes in market conditions nor extreme events such as disasters or the outbreak of war are valid events for termination. The only negative is perhaps the fact that the termination fee is ‘just’ $53.4 million, or approximately 3.6% of the current deal value. If Targa Resources would really want to get out from the agreement they could do so. Since both stocks have moved in aggregate a limited about since the deal was announced in October, and with a very high correlation, I doubt that anything has changed so far that would lead to the acquiring party wanting to cancel the deal. Since we are receiving one security with an uncertain value it is impossible to calculate what the potential return of the merger arbitrage is, but this might exactly be the reason why there is an opportunity here. People who ordinarily would play the merger arbitrage game might not enter because they don’t want a large exposure to the new Atlas Energy Group that cannot be hedged. 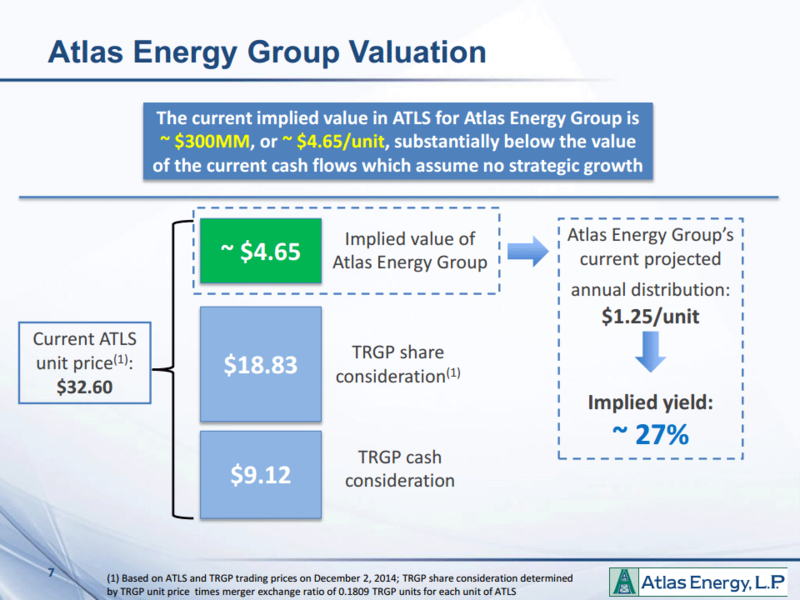 At the same time the people who would want to buy just the new Atlas Energy might not be interested in the merger arbitrage game since you need a lot of gross exposure to ATLS and TRGP to buy a small new Atlas Energy position. Some of these numbers are already outdated and a bit lower while other are potentially too optimistic, but if it’s roughly right you still get a great deal. The stub is currently trading for $4.21, so if it’s worth $13 you would be looking at more than 200% upside! That should give you some wiggle room to adjust certain items downwards. 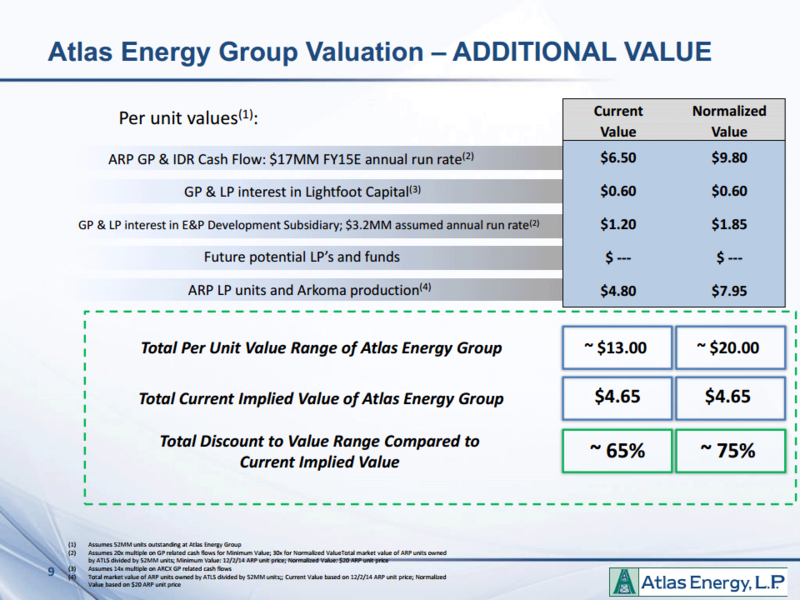 Almost all value is related to Atlas Resource Partners. The company owns 100% of the General Partner (GP) Interest, 100% of the Incentive Distribution Rights (IDRs) and a 27.7% Limited Partner (LP) Interest. The limited partnership units are easy to value since they are traded on the NYSE under the ARP ticker. The general partnership units are also relative straightforward since they are entitled to 2% of ARP’s cash distributions. With ARP currently trading at a >19% yield I think we have to conclude that the current distributions are not sustainable, and that makes sense since oil prices have dropped a lot. Perhaps a bit crude, but if the current price is right a fair yield is probably roughly half the current yield. This would mean that the company would distribute approximately $100 million per year to LPs, and as a result the GP would be entitled to ~$2 million/year. This would also imply that the IDRs would be far out the money since they only start to generate cash flow at distributions of more than $0.47/quarter. This represent a yield of more than 15% at the current market price. So I have a huge discrepancy between the fair value estimate from management and my own estimate. A $17 million revenue stream at a 20x multiple (pretty high) is worth $6.50/share. A $2 million revenue stream at a 15x multiple is worth just $0.60/share and would eliminate almost all upside even if we take all other estimates at face value (I think some need to be adjusted downwards, but not by a whole lot). Thanks Lee. Well of course I think our latest acquisition demonstrated how we can actually grow, we expect profitably without issuing additional equity at these ridiculously low prices. Although one should note that the entire sector wrongly in my opinion is creating yields that are in double-digits. So that part is really foolish, but you will know more about the market than I do. But I do know that with the imagination as we’ve demonstrated one can do deals even where common wisdom would say you can’t do great deals. And I think our counter cyclical approach has proven to be very useful in the past and we’re just watching as the panic in the oil patch increases, we’re in a position now to diversify nicely. Or are they perhaps right and is there here indeed a great opportunity? And if they are right wouldn’t it make more sense to buy ARP directly? What do you think? No position in ATLS, TRGP or ARP at the time of writing. This entry was posted in Research and tagged ARP, ATLS, TRGP on December 7, 2014 by Alpha Vulture. Still working through this myself and no position, but at first glance it seems like the ARP LP interests alone could be enough to make the risk/reward make sense. I feel like I’m missing something, as it seems like the “current value” vs. “additional value” description more or less captures it. The stub trades at $4.21 and the market value of ARP units it holds is $5.85…isn’t the rest commentary? There’s some merger risk to be sure. But otherwise, even if the estimates for the value of GP interests are overstated, management is a bit too promotional, future distributions will be a little lower even with hedging, and the IDRs are too far out of the money to contribute much, it seems like that ~$4.80 estimate (now ~$4.30 at latest ARP price) of ARP market value and Arkoma less debt is pretty solid. At the very least I think the stub is more attractive than ARP directly, as you are creating it at a slight discount and getting some call options thrown in too. Question in my mind is whether I want to own ARP at all even with this potential mispricing. The ARP LP interests + $1.15/share for Arkoma – debt is indeed worth ~$4.30/share. But I think it needs to be worth a decent amount more before the stub is interesting because this would imply that the merger arb spread is just 0.3% (stub price is $4.20 now). Add 1$/share in value for the ARP GP/IDR interests and the other assets and you are looking at a 3.3% spread. Doesn’t scream like an extremely good deal to me. It’s a better deal if ARP is undervalued (I think it could be), but in that case betting directly on ARP might make more sense. The stub has a lot of leverage to ARP, but that is lost as part of the long/short trade. A position in ARP that gains 10% could be worth more $$$ than the stub gaining 100%. Though to compare risk though since they are not the same. ARP is mostly nat gas, plus it earns fees off the (tax driven) oil investment partnerships originates / manages for retail investors. Management has a history of doing intelligent ‘asset conversions’ to monetize discounts which can be tremendously valuable. This is not all that common amongst managements, so this is extra beneficial in itself. Management has a history of very questionable risk management. Atlas Pipelines was one of the very few MLPs to eliminate its distribution during the financial crisis, and along with DPM it was one of the MLPs to engage in extensive dirty hedging, which in effect is using crude oil hedges to hedge NGL price risk (via POP and Keep Whole contracts). Both companies underwent severe financial distress as a result, and this was reflected in their share prices, credit spreads, etc. This sort of ‘hedging’ is rather odd because it smooths results (aka reduces upside risk) in good times, and really doesn’t work at all during bad times. These points on risk management may be stale or otherwise unfair. I am convinced that managing left tail risk is one of the most important things in risk management, and I don’t think the Cohen’s actions indicate that they agree. With oil prices taking a huge tumble (and ultimately NGL prices and non-US nat gas prices too), this is something to think about. Thanks for the background info. I guess you can figure out how much risk you are taking (and they are) when looking at debt levels and hedges. Shouldn’t be a black box where you just have to trust management to manage risks (like at a bank). Loved this post. Working on digging deeper into the situation right now but, based on my surface level understanding, would it make sense to go long ALTS and short TRGP until the spinoff is complete? This would allow investors to access to the potentially very undervalued Atlas Energy Group with minimal exposure to the extreme pricing fluctuations in the oil market and merger cancellation risk. Just a high level thought at this point – have not necessarily thought through all of the implications. Long ALTS and short TRGP would exposure you to deal cancellation risk. In a worst case scenario you could lose money on both legs of the trade. The volatility of the long/short position as a whole is of course limited, but you would have exposure to the stub, and the value of the stub can change drastically. For example: yesterday the stub price dropped from $4.20/share to $2.74/share: a 35% drop and a way larger drop than the ~10% of ARP/ATLS/TRGP. Since this deal and the ALP/NGLS deal are codependent, you can use the spread on the ALP/NGLS deal to estimate the portion of the spread that is merger arb risk. This is currently $1 – $1.2. In other words, adding $1 to the current spread gives you the implied value of the stub. Furthermore, if you wanted to isolate the stub from the merger risk (and had a lot of excess balance sheet) you could buy the ATLS deal (buy ATLS, short TRGP) and short the APL (short APL, buy NGLS). Nice post. They give you commodity sensitivity for New Atlas in their form 10. I think it was filed in late November. Natural gas is the predominant driver here – oil much less so.